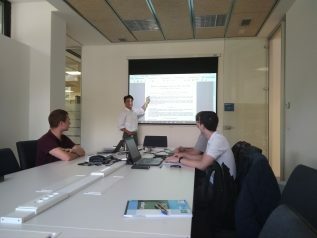 On tuesday, September 25th, Eneko Unamuno and Jon Andoni Barrena from the University of Mondragón visited DeustoTech for a meeting with the local partners to continue working together in the COSNET project. 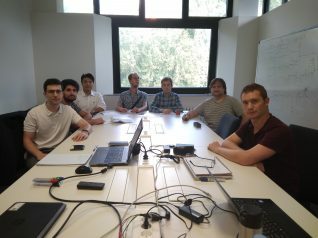 This project aims to do a thorough research in the Control and stability of Hybrid AC/DC Electrical Grids. Review of the principles of operation of classic electrical systems. Problems associated to networks with high penetration of electronic power systems. Linear control techniques for the primary regulation and emulation of inertia in both alternate current(AC) and direct current(DC) systems. Introduction to non-linear analysis techniques applicable to electrical systems, based on passivity methods and singular disturbance. Introduction to the origin and fundamentals of oscillators based on the Liénard equations.